Paul Holleran has called for his side to be more pragmatic as they chase a first home point. 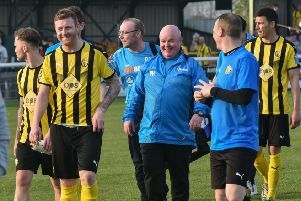 Leamington boss Paul Holleran is backing his side to break their home hoodoo against Bradford Park Avenue tomorrow but says it might need a change of mindset to do so. Despite picking up two wins and two draws on the road following their promotion to the National League North, Brakes have failed to garner a single point on home soil, losing all five of their fixtures. However, Holleran is adamant a first home win is just around the corner. “Away from home we’ll take that,” said Holleran who saw Brakes follow up two draws from tricky league trips with an FA Cup second qualifying round win at Westfields last Saturday. “At home we know we need to start picking up points. “The more it goes on the more it will be talked about. “In a number of games we’ve been in a position to get a point or victory but teams haven’t had to work hard to get the three points. “We’ve shown character and guts on the road with three strong, solid performances. “We now need to show some of the signs we show away. “There’s a tendancy to want to play a bit more on the front foot (at home) but maybe we need to sit in a bit more and not be susceptible to the counter attack and take it from there. The visit of Avenue represents another tough assignment for Leamington with Mark Bower’s side only outside the play-off spots on goal difference. Three of the West Yorkshire side’s five wins have come on the road and Holleran admits the quality of the division will make a first home win hard-earned. “On Saturday another good side are turning up. “It’s not like it’s a Cinderford or Dunstable where you think you can put a few goals past them. “There’s been massive investment there and the side has been put together with the intention of getting out of the league. n Brakes have been drawn at home to Gainsborough Trinity in the third qualifying round of the FA Cup with the tie taking place on September 30.